On August 13, 1769 reaching the junction of the Arroyo Mupu with the river, the place was named the Holy Martyrs, Ipólito and Casiano. 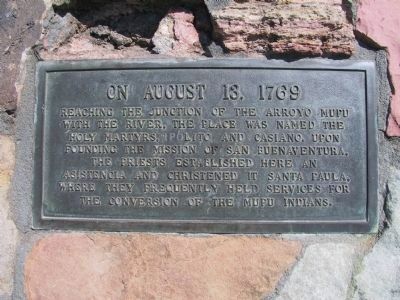 Upon founding the Mission of San Buenaventura, the priests established here an asistencia and christened it Santa Paula, where they frequently held services for the conversion of the Mupu Indians. Marker series. 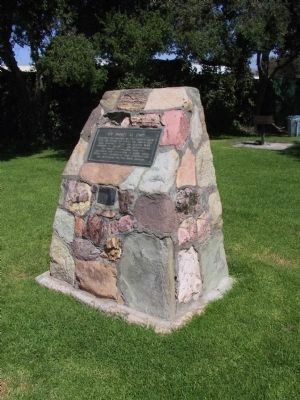 This marker is included in the Gaspar de Portolá Expedition, and the Native Sons/Daughters of the Golden West marker series. Location. 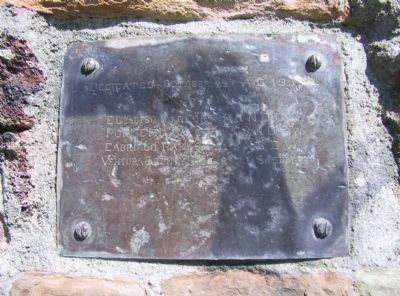 34° 21.351′ N, 119° 3.052′ W. Marker is in Santa Paula, California, in Ventura County. Marker is on East Harvard Boulevard, on the right when traveling east. Touch for map. Marker is located northeast of the Santa Paula Boys Club Recreation Center in Harding Park. Marker is at or near this postal address: 1458 East Harvard Boulevard, Santa Paula CA 93060, United States of America. Touch for directions. (approx. half a mile away); Familia Diaz Cafe (was approx. half a mile away but has been reported missing. ); Saint Francis Dam Disaster Memorial (approx. 0.6 miles away); The Ebell Club (approx. 0.9 miles away); Tanner Homestead (approx. one mile away); St. Francis Dam Disaster (approx. 1.7 miles away); Santa Clara Schoolhouse (approx. 3.2 miles away); Faulkner House (approx. 3.8 miles away). Touch for a list and map of all markers in Santa Paula. More. Search the internet for Portolá Expedition. Credits. This page was last revised on July 27, 2018. This page originally submitted on December 28, 2011, by Michael Kindig of Long Beach, California. This page has been viewed 686 times since then and 10 times this year. Last updated on January 9, 2012, by Michael Kindig of Long Beach, California. Photos: 1, 2, 3. submitted on December 28, 2011, by Michael Kindig of Long Beach, California. • Syd Whittle was the editor who published this page.